(Fresno, CA) February 1, 2016 – Encore Restaurants, LLC, a subsidiary of the Dallas-based Encore Enterprises, Inc., opened its newest Five Guys Burgers and Fries restaurant today. 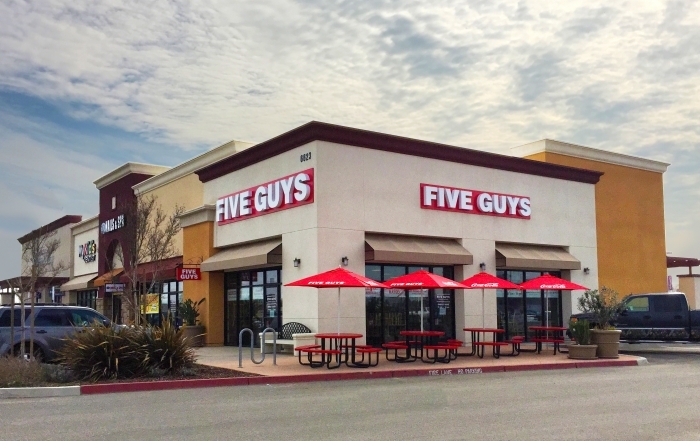 The restaurant located at 6623 N. Riverside Drive, Suite 105 in Fresno, CA and is the ninth Five Guys restaurant to be owned and managed by Encore Restaurants, LLC. Open every day from 11 a.m. to 10 p.m. Five Guys serves award-winning burgers, hot dogs, and fries that are fresh, never frozen, and customizable for any taste with over 250,000 burger options to be ordered. Five Guy’s has been ZAGAT survey rated every year since 2001 and has been voted the Washingtonian Magazine’s “Readers’ Choice” #1 Burger every year since 1999.